The world finally catches up to what Laos does best. Hemmed in by culinary giants Thailand, Vietnam and China, the cuisine of Laos has never enjoyed the attention it deserves, but one Vientiane chef is determined to change all that. In this fast-paced world of ours, some things are still best enjoyed slowly. For Ponpailin Kaewduangdy, known to her friends as Noi, this means food: from the selection of fresh and seasonal local produce, to respect for traditional recipes, and most importantly, the pleasure of an unhurried home-cooked meal shared with friends and family. The grassroots organisation, Slow Food, was founded in 1989 by Carlo Petrini to prevent the disappearance of local food cultures and traditions, counteract the rise of fast life and combat people’s dwindling interest in the food they eat, where it comes from and how our food choices affect the world around us. 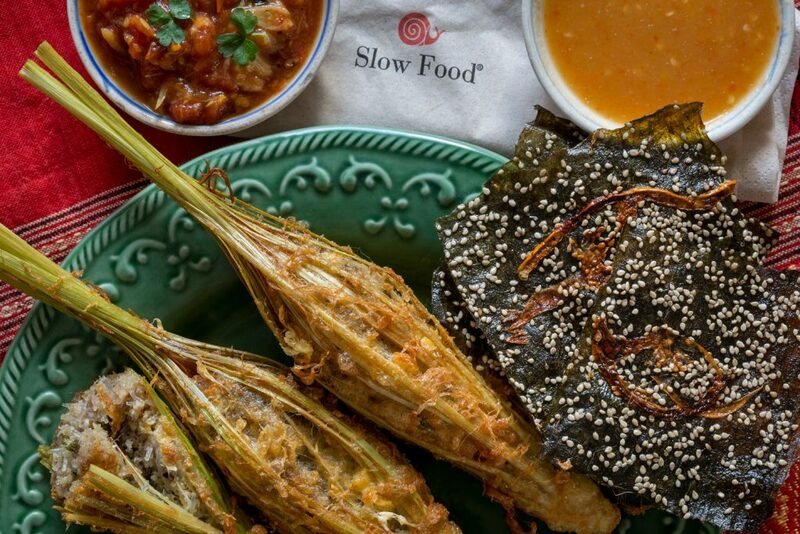 Today, Slow Food has grown into a global movement involving millions of people in more than 160 countries, all working to help ensure we have access to good, clean and fair food. For Noi, its aims and values are particularly pertinent for modern-day Laos. When Noi’s colourful restaurant opened last year, she quickly gained a reputation for her daily-changing menu of authentic Lao food. Last year, she was delighted to receive an invitation to attend Slow Food’s biennial event, Terra Madre del Gusto in Turin, northern Italy. While in Turin, Noi cooked food in the Asia and Oceania Kitchen. “My menu included oua hua si kai, lemongrass stuffed with pork, glass noodles and herbs served with jaew mak len, a spicy chili and tomato dip, and kai pen, fried Luang Prabang river weed.” Noi laughs when she says she had to send her proposed menu to Slow Food in advance, but when she arrived in Turin it had been change to ‘pork stuffed with lemongrass’. The Slow Food organisation has also been instrumental in the creation of the Ark of Taste, which maps and researches traditional food products in order to promote and safeguard biodiversity, while also supporting small-scale producers. Noi recently nominated kai pen river weed, and is delighted that is was accepted as an Ark of Taste product. “Laos has many indigenous products worthy of protection, and I intend to nominate several others,” she says. A highlight of her time at Terra Madre del Gusto was meeting Carlo Petrini, the founder and president of Slow Food. “Carlo is a food hero and an inspiration to thousands of people around the world,” she says. 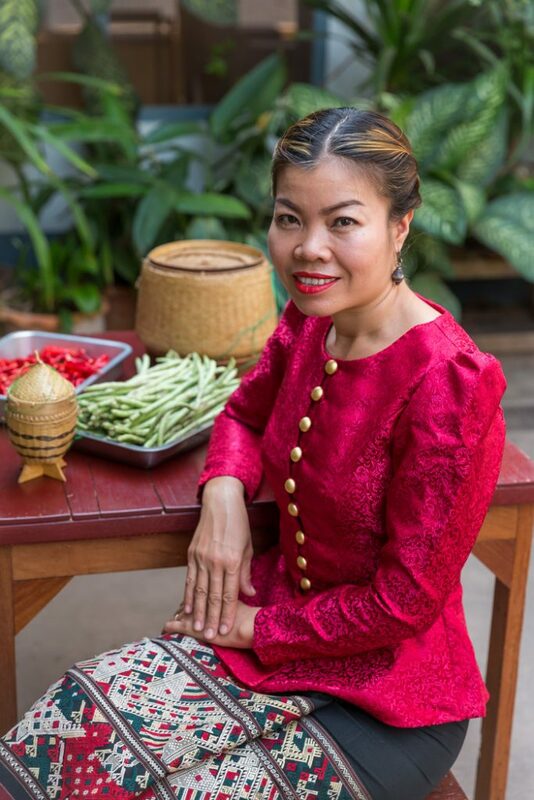 Bolstered by her experience, Noi returned to Laos full of ideas for Doi Ka Noi and her distinctive cuisine. “In recent years, the food scene in Vientiane has changed and not necessarily for the better. Sure, there is more choice but our own cuisine is becoming debased by fads for fusion, the influence of neighbouring Thailand, an influx of fast food and international restaurants, chefs using poor quality ingredients, liberal use of MSG and stock powders, and a young generation that has little interest in its own food,” she asserts. What I discovered at Terra Madre del Gusto is that I am not alone in believing that my food culture is worth defending.There are millions of people around the world fighting to uphold culinary traditions and biodiversity. Here in Vientiane, I have loyal customers who understand what I am trying to do and I am very grateful for their support and encouragement. Word about Noi and her delicious food is certainly spreading. Just last month, Timm Vladimir, the Danish celebrity chef, two-time Masterchef winner, cookbook author TV host and passionate foodie, was in Vientiane as an advocate for the charity CARE, and Noi spent a memorable day teaching him the secrets of Lao food. 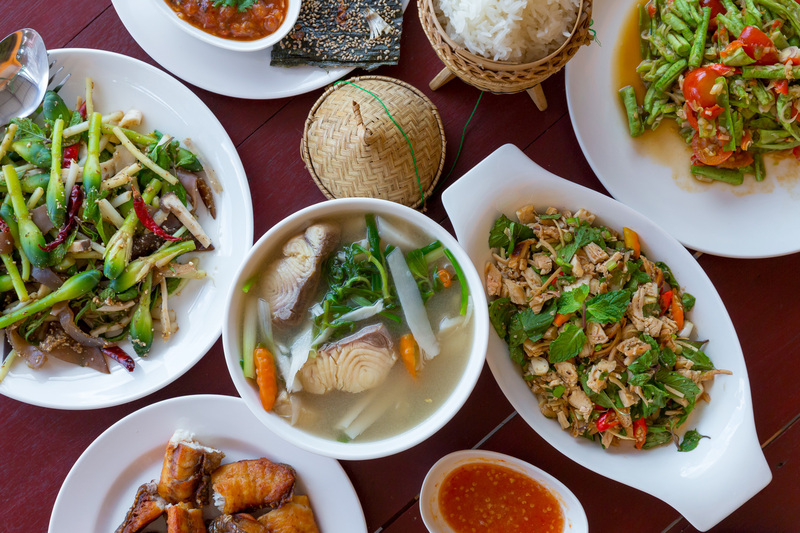 At Doi Ka Noi, the celebrity chef discovered that all ingredients are bought fresh from the market each morning, soups and stocks are made the old-fashioned way without the need for MSG, and sausages are home-made. Depending on the season, the daily changing menu of just seven or eight items can include ingredients dok krajeow wild ginger flowers, a tiny but flavourful mushroom called hed bee that grows on tamarind trees and is only available for a few weeks a year, pak koot foraged fiddlehead fern tops, and others used in dishes rarely found elsewhere. Noi is a passionate and intuitive chef, and Doi Ka Noi is clearly much more than a commercial venture. It reflects her history and her outlook on life today. “I learnt to cook as a young girl at my late grandmother’s side. The recipes I use every day are tangible memories and a celebration of my love for her,” she says. Noi grew up in a rural subsistence farming community in Khammouane Province, and while now a modern city lady, she loves to tend the herbs and vegetables growing in the Doi Ka Noi garden. Provenance and traceability are increasingly important to her and she hopes to source more produce from organic local farmers. “It will be a slow process of natural development. But all the better for it,” she says.